You know what they say about big hands? I'm not sure what you just answered with... but you know one thing they don't say about big hands? That you cannot fit big hands in a Pringles can. What's up with that? 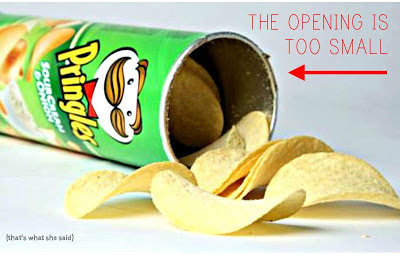 I like potato chips, I do, but give me a break with the little can Pringles people. I just want to sit on the couch and watch TV without interference from a bag of chips like the rest of America (and maybe Canada or anywhere else that watches TV from their couches). The trouble with the bags are they make too much noise which then causes me to turn the volume up louder and, since I'm crazy, my TV has to be on an even number level-wise so I have to turn it up two notches and if the kid is sleeping I may run the risk of waking her which then (this is the big one) will cause my wife to turn into a fire breathing dragon because I woke the kid. She'll leap across the couch engulfed in a fireball knocking the chips out of my hands and getting crumbs everywhere completely ruining our couch -and our evening- in the process. For the love of... all of this could be avoided if I could fit my hands into the can of Pringles. But I can't. I'm a man. I have large hands. I like chips. This is discrimination. Sort of. Maybe not. Or I could just stop eating chips, it is the New Year after all, but I don't think either of us want that to happen. Except my wife. And maybe my waistline. So the curiosity is killing me, what do they say about big hands? Who are they? And do they eat Pringles? I have small hands and those pringle cans give me trouble. I thought they made wider cans! Or are they just taller????? I think maybe taller? I haven't found any that are wider so if you come across them somewhere, let me know! Meanwhile, I guess I'll just have my wife ration them out to me like a 2 year old. wow, so I'm liking the first 3 posts I read. I have, ALSO, wondered that about Pringles. I have very petit hands, and I even have difficulty getting those things out...tilt and pour, baby! Then the damn thing produces like half the container in your hand and your friends look at you like you're a little piggie... "thanks for hogging all the chips." You know, once you pop...you can't stop? Yes! Exactly. I'm so glad someone gets it.